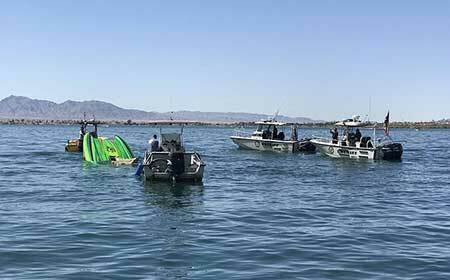 Lake Havasu City, Arizona—A day filled with festivities turned tragic when a high-performance speed boat driven by Brad Kloepfer, age 57, flipped following the Desert Storm Shootout on Saturday afternoon. Mr. Kloepfer and a passenger, Paul Selberg, age 69, were killed in the accident. Mr. Kloepfer’s wife, Connie Davis Kloepfer, age 58, remains hospitalized in critical condition. All three are from Lake Havasu City. The boat reportedly was traveling at high speed when it hit a wave that launched it 50 feet into the air, causing it to flip. Boats passing nearby pulled the victims from the lake and started life-saving measures. Emergency responders with the Mohave County Sheriff Office's took over care and all the injured were transported to Havasu Regional Medical Center. Preliminary investigation reports indicate everyone was wearing life jackets and the operator was wearing the safety kill switch. The boat eventually was recovered from the lake bottom. The investigation is ongoing. We extend our condolences to the Kloepfer and Selberg families and friends over this tragic loss and we wish Mrs. Kloepfer a swift and complete recovery.